'Jeeves Intervenes' runs through May 27 at Andrews Hall, 276 E. Napa St., Sonoma. Thursday–Saturday, 7:30pm; Sunday, 2pm. $22–$37. 866.710.8942. 'The Compleat Wrks of Wllm Shkspr (Abridged)' runs through June 3 at the 6th Street Playhouse Studio Theatre, 52 W. Sixth St., Santa Rosa. Thursday–Saturday, 7:30pm; Saturday–Sunday, 2pm. $18–$28. 707.523.4185. INCOMPLEAT 6th Street Playhouse’s Shakespeare mashup is too darn loud. That the name "Jeeves" immediately conjures up the image of a staid British manservant is a tribute to the staying power of author P. G. Wodehouse's character. Since Jeeves' first appearance in 1915, he's been featured in films, television and an internet search engine. There was but a single theatrical venture until playwright Margaret Raether began writing a series of plays beginning with Jeeves Intervenes, running now at Sonoma Arts Live. Jeeves (Randy St. Jean) is the unflappable valet to Bertram "Bertie" Wooster (Delaney Brummé), an upper-class twit whom Jeeves is constantly rescuing from troubles of his own making. Under pressure from his imperious Aunt Agatha (Jennie Brick), Bertie finds himself engaged to Gertrude Winklesworth-Bode (Libby Oberlin), with whom Bertie's ne'er-do-well friend Eustace Bassington-Bassington (Nick Moore) has fallen hopelessly in love. Other complications arise, but leave it to Jeeves to sort it all out. It's a snazzy production with nice costume and set design work. Director James Jandak Wood has cast it well, with St. Jean perfect as the imperturbable Jeeves. There's good work from the supporting players, but Jandak erred in having Brummé play Bertie with a voice that can best be described as annoying. How annoying? Well, he had me envisioning a sequel titled Jeeves Drowns Bertie in the Thames. Wodehouse published a collection of essays titled Louder and Funnier, which is the direction Jared Sakren must have given the cast of the 6th Street Playhouse production of The Compleat Wrks of Wllm Shkspr (Abridged). 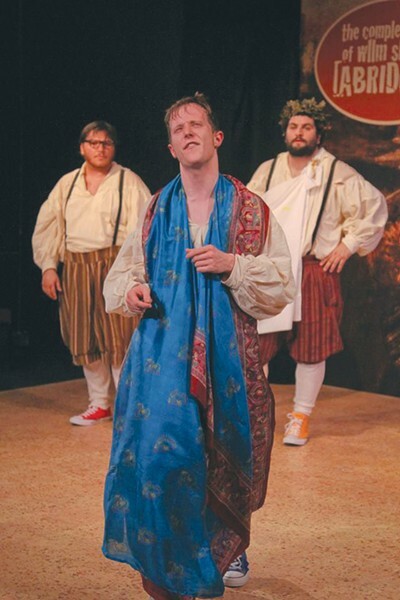 The hard-working and talented Nick Mandracchia, Zac Schuman and Erik Weiss expend significant energy in comically presenting 38 Shakespeare plays in two hours, but it needn't be delivered almost entirely at a decibel level that rivals the nearby SMART train. The show is a fast-paced series of jokes, bad puns, quick changes and audience interactions. Some things work, others (like the attempts at topical humor) don't. What comedy there is to be found is often drowned out by the vociferous cast.